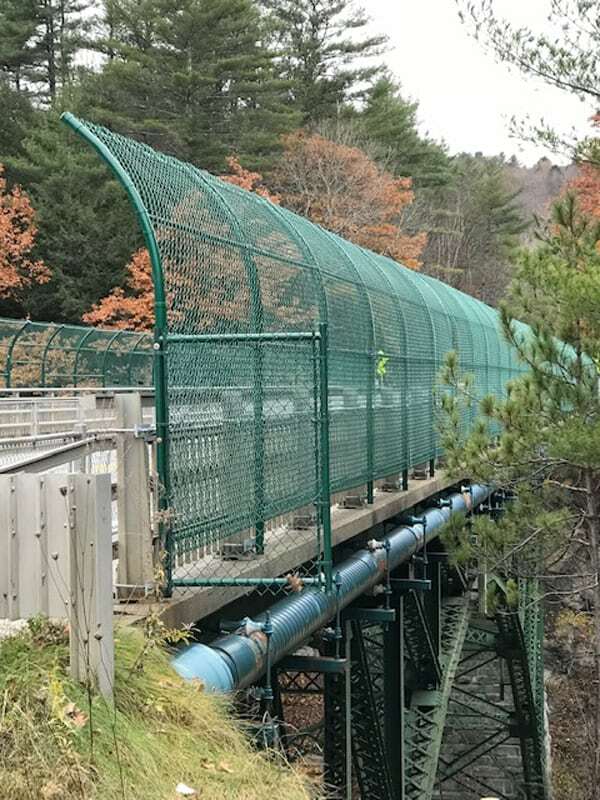 Nine-foot tall suicide prevention fences were installed on the bridge overlooking the Quechee Gorge. state park with a dramatic view that attracts 100,000 visitors each year. Local businesses, residents, and the Hartford Police and Rescue emergency responders have worked with the Agency of Transportation to get the fences installed. For the last 14 years an average of one person per year has jumped from its 165-foot height above the rocky cliffs and the Ottauquechee River. According to reports, there have been 19 successful interventions on record. There has been talk for years about suicide prevention, but prospective measures have met with resistance from local tourist businesses and from the tourists themselves, who feel the view of the Gorge would be compromised by whatever measure was employed. David and Regi Cooper, whose 21-year-old son Derek lost his life at the bridge on July 4, 2011, have been vocal advocates for meaningful measures. A witness to his death reported Derek may have been trying to climb back onto the bridge before he fell. The Coopers feel any assistance for those who might change their minds would be a good thing. The fence installation was supposed to begin in the summer, but was delayed to avoid creating traffic problems during the peak foliage season. During the postponement, VTrans installed bright light towers illuminating the entire bridge, and an Orange County Sheriff deputy was on duty every night, from 5 p.m. until 8 a.m. the following morning. Two summers ago, two telephone towers linked to a 24-hour hotline at Headrest, a non-profit Lebanon counselling service, were installed. People in distress may press a button on one of the solar-powered towers and speak immediately to someone. The Mountain Times was unable to find out if the towers have been used. In 2016 the Vermont Legislature ordered a study of the problem and possible solutions, ultimately deciding to install 9-foot tall green fencing, attached to the railings. This is a temporary measure, J. B. McCarthy, spokesperson for AOT said, as the bridge is due for a major overhaul. At that time the current fencing will be replaced with either nets or another fence, McCarthy said, and the sidewalks will be widened. Ronan said she liked the fence because it makes the whole experience of looking down into the deep gorge much more comfortable. She and Jeff make it a point to visit the gorge whenever they are in the area. “And there are open spaces in the mesh to take photos,” she said.